WASHINGTON — They’ve been one of the biggest trends in scholastic and recreational sports for more than a decade now, but mounting health concerns about the use of synthetic turf is resonating in the halls of the Maryland Legislature. On Thursday, a group of lawmakers introduced a bill that would prohibit the state from using any public money to build or renovate synthetic surfaces. It would impact schools and parks, especially the ones that receive grant funding through Project Open Space. Concerns about turf are primarily related to the potential health impacts. Del. Aruna Miller started off, noting “they are made with plastic blades of grass that are often painted with lead paint” to make the green turf shine as much as it does. Thousands of tires are then broken down into little pieces to help cushion the surface. But the carcinogenic properties have led to questions about whether it increases the risk of disease. “Artificial turf fields are also a bacterial breeding ground,” said Miller, who also brought up problems with “turf burns” sustained when someone’s skin slides across the surface, ripping the skin off. Miller argued it can take months for the turf to rid itself of the sweat, oils, bacteria and dirt left behind by people if the turf isn’t cleaned. The bill did generate some opposition though. Some of the arguments tried to cast doubt on the health concerns, noting that much of the scientific research and studies of the surfaces haven’t been fully conducted and peer reviewed yet. And as demand for parks and fields continues to rise, the versatility synthetic turf offers can’t be matched by grass. “They allow for much greater usage rates than regular turf fields,” said Les Knapp, who is with the Maryland Association of Counties. Switching back to natural grass “also risks making these types of facilities less accessible for those with disabilities,” said Frederick County Republican Del. David Vogt. Accessibility is a persuasive argument at the local and county level, where agencies are tasked with meeting the increasing demand for recreational facilities. Football, soccer and lacrosse all require similar sized surfaces and the synthetic turf is more capable of hosting those events on a daily or weekly basis without wearing down after repeated usage. But proponents of the bill argue in the long run, the cost of going synthetic doesn’t pay off. 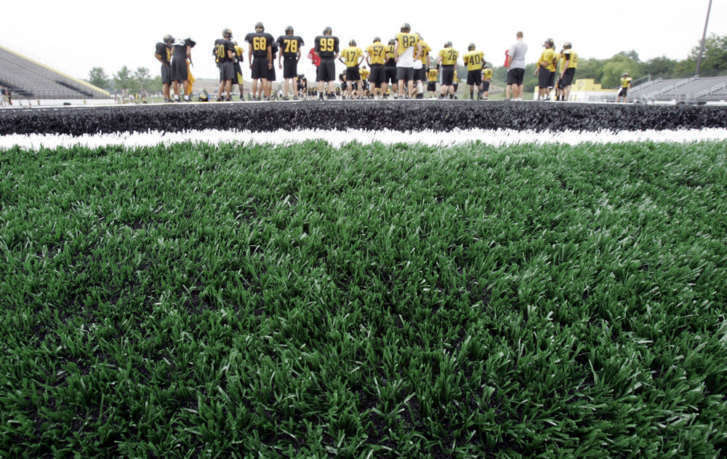 The legislation notes that even though natural grass can cost about $30,000 a year to maintain — far more than the $4,000 needed to maintain synthetic turf — the $800,000 it costs to install a synthetic turf field removes the financial incentive to switch away from natural grass.